Apollo Bay is a coastal town in southwestern Victoria, Australia. 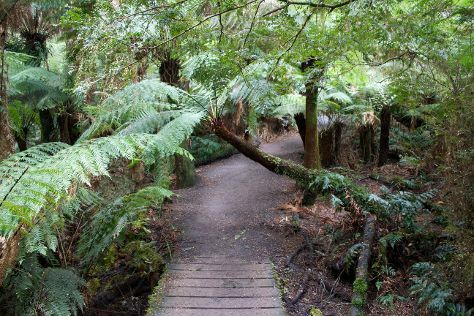 It is situated on the eastern side of Cape Otway, along the edge of the Barham River and on the Great Ocean Road, in the Colac Otway Shire. The town had a population of 1,095 at the 2011 Australian census.It is now a tourist destination, though it is smaller and quieter than other nearby places such as Lorne. It is also host to the annual Apollo Bay Music Festival and the Great Ocean Sports Festival.In winter to spring, southern right whales come to the area mainly to breed, to give birth their calves, and to raise them in the warmer, calm waters of South Australia during their migration season. Less frequently, humpback whales can be seen off the coast.HistoryApollo Bay was part of the traditional lands of the Gadubanud or King Parrot people of the Cape Otway coast.In the 1840s the Henty brothers established a whaling station at Point Bunbury on the western end of the bay. The bay was named by a Captain Loutit in 1845 when he sheltered his vessel, the Apollo, here from a storm.The first European settlers were timber cutters in the 1850s who subsequently established sawmills. Farmers later moved into the area and a small settlement on Apollo Bay named Middleton developed. A Post Office of that name (with a fortnightly mail delivery) opened on 1 May 1873 (relocated to the township of Krambruk in 1881 and renamed Apollo Bay in 1898). During this period almost all access to the area was by sea. Apollo Bay is in Victoria. Use our Australia online trip planner to arrange your visit to Apollo Bay and other destinations in Australia.